Onion pickle is mostly used in South Indian dishes but our onion pickle tastes different as it is sweet because of jaggery and sour because of lemon and mustard seeds powder with awesome aroma. 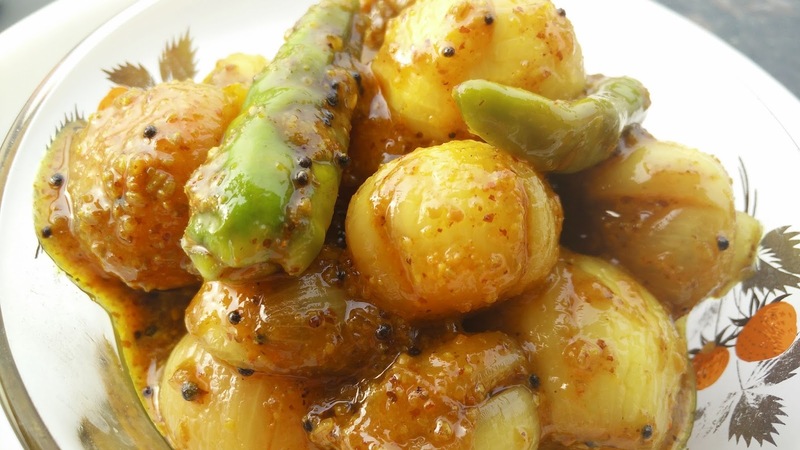 This pickle recipe is must try with roti or bread or even Indian most famous snack Cholle Bhatura. 1. Peel off the onions and marinate in a mixture of salt, turmeric and lemon juice for 1-2 hours. It will leave water after some time. Remove water and spread on sieve/ plate for drying. Once dried sauté the onions in little oil and keep aside. 2. Dry roast coriander seeds, fennel seeds, fenugreek seeds and grind to powder. 3. For tadka/tempering – splutter mustard seeds in little oil and keep aside. 4. In sauté onions add, Mustard seed powder, green chilly, garlic cloves, salt, red chilly powder, asafoetida, tamarind paste jaggery. Mix well and add the tempering on it. 5. Transfer the contents into a glass jar and keep the pickle at room temperature for at-least 2 days till it is ready. Serve with bread or roti.